The lack of a version of Adobe's Flash Player at launch is a rather big hole in the phone's functionality, what with Flash compatibility being one of Android's key recent boasts. But it will arrive soon enough, despite Adobe's lack of commitment to the mobile format, with a Google employee telling SlashGear "Flash hasn't been released for ICS yet so as far as we know, Adobe will support Flash for ICS." As for the volume control bug? That's been reported by many new owners over on the power-user XDA forums and even Samsung's own Facebook page, with some Galaxy Nexus owners noting the phone has a life of itself when it comes to audio levels, often reverting to a full mute — and silencing ring tones and notifications. 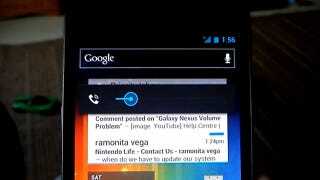 There's a video of the Galaxy Nexus volume glitch online here, if you need visual proof before believing anything you read on internet forums.